Personalized and custom design exclusively for Wine Enthusiast. Does the decanter have a good seal? 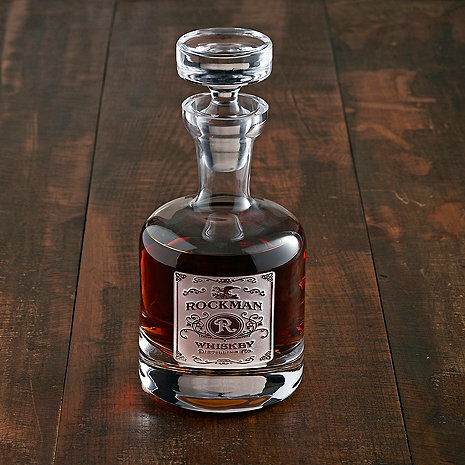 BEST ANSWER: The Personalized Etched Whiskey Label Decanter does have a glass stopper which is specifically designed to fit the decanter and subsequently makes a good seal. It’s a glass top, no rubber grip to keep air tight. So I’m sure some minor vaporation occurs. Can you put the word tequila instead of whiskey on the decanter? BEST ANSWER: Whiskey is automatically printed on the decanter. Can you put tequila Instead of whiskey? BEST ANSWER: I have this decanter filled with Kentucky Bourbon so the etching shows up clearly. I haven't tried filling it with a clear liquor like tequila. I would imagine it would still look beautiful as the etching is highly frosted in tone. I normally don't write reviews . But the quality of this decanter is amazing . I've purchased other decanters from other companies and when they arrived i was disappointed with them . This one is well made and deeply etched . I'm a very happy customer ! Gave as a gift and the recipient loved it! Has received raves from friends and inspired them to redo their bar area. Highly recommend. This is even more beautiful in person and very high quality. The only downside was that someone had used a thick black sharpie to write the contents on the outside of the box in sloppy handwriting, making the box totally unsuitable for gift-giving. We had ordered this as a gift, so that was really a letdown. Otherwise, though, it came out beautifully. This decanter is made from quality, heavy glass. A first class product that deserves to be displayed. I gave this crystal decanter to my nephew for Christmas. He LOVED it! Highly recommended. The quality and workmanship is perfect.